What is the BJCC Arena Club? The BJCC Arena Club is our exclusive lounge that is limited to 500 guests and available for most arena events. Passes must be purchased in addition to an event ticket. These passes are sold separatley through Ticketmaster or the Central Ticket Office. What are the benefits for Arena Club Passes? 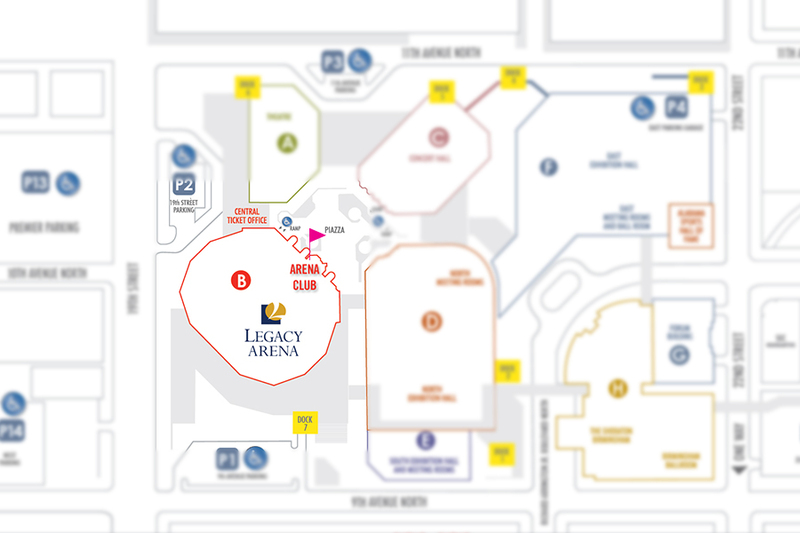 The Arena Club opens two hours before the event time stated on your event ticket. This allows you to arrive early for parking and meet up with friends for drinks before the event. Because the club is limited to 500 guests, you can expect shorter lines for merchandise, food and beverage and even restrooms! You may access the Arena Club at any time during the event. BJCC Arena Club Passes are available for purchase online at Ticketmaster.com, by Phone at 800.745.3000, and also through the Central Ticket Office during normal business hours. How do I enter the Arena Club? Enter the Arena Club Doors from the middle of the BJCC Piazza. Access from any parking lot by walking to the middle of the complex. Look for the signage above the doors on the side of Legacy Arena. Are BJCC Arena Club Passes available for all shows? The BJCC Arena Club may not be available for all events. Please check Ticketmaster for availability or call 205.458.8400 ext. 3 during normal business hours.